Scientists launch mission to the deep Jump to media player Biggest ever deep Atlantic exploration mission launched by UK scientists. Titanic's sunken sister Jump to media player The BBC's Andrew Bomford dives more than 100 metres underwater in a submarine to see the wreck of the Britannic in the Aegean, where it sank in 1916. Penguin diary: Charting a year in the life Jump to media player Victoria Gill joins a team of scientists as they set up remote cameras to observe penguin colonies in the Antarctic. Launching this week, the Atlas project - involving 24 research institutions around Europe and North America - will spend four years studying the deep sea, exploring unknown ecosystems and measuring the changing ocean currents that impact on our climate. 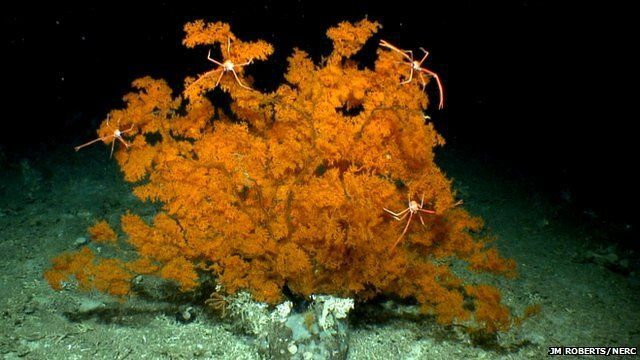 The project, funded by the EU Horizon 2020 research and innovation programme, will explore some of the remarkably diverse ecosystems shown here - gathering samples and filming creatures at ocean depths of many kilometres.